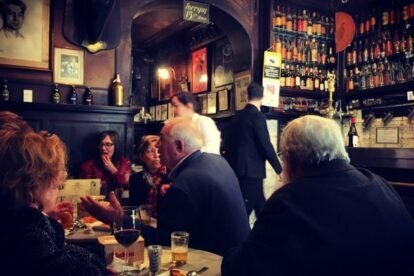 Opened in 1787, Taberna Antonio Sanchez is one of, if not the oldest bar in Madrid. Under its current name it has been active since 1884, and the interiors have been preserved since then; tiles, antique cash register, gas lighting, bulls heads and all. If you want to try some classic Madrileño dishes, this might be a good place to start. Cheese and charcuterie plates go well with wine and vermouth, and I would recommend you add to that some croquetas (made from béchamel, not potato) and tortillitas de camaron (lacy pancakes made from chickpea flour and tiny whole prawns – so delicious). If you want something filling and are adventurous, try a cazuelita – different stews featuring tripe, snails or meatballs. There is no catering for tourist tastes here, and Taberna Antonio Sanchez is still well frequented by locals. They give you a generous tapa here every time you order another drink – I love this in Spain. You are much less likely to get drunk if you are consuming food while you drink. And remember; take your time – Spain is different!